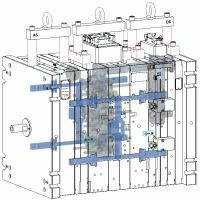 It has been a year since we have launched a project in which a mold structure is used according to the Tandem technology, a patented system by the German company T-Mould. The technology is based on the use of two separate sub-faces in a mold, wherein the cooling time is used in order to be able to use our injection molding machines more efficiently. C. there is the possibility to, if desired, produce separately as well. For us the additional advantage of this technology is that by using only one injection molding machine simultaneously two separate parts, each of which can produce six-fold, can be made. This prevents us from making large stocks of two products, before both parts can be put to the assembly line. Another added benefit is that only one machine is constantly occupied. The mold is equipped with a 12+2-way needle valve system, created by a specialized tool maker from Germany, who has much experience with the tandem technology and gave us the opportunity to test a matrix structure in Tandem mode in advance. Before applying the Tandem technique on Rompa’s production site, one-time software and hardware ​​modifications were made to a 275-ton injection molding machine. These adjustments make it possible to produce, in addition to conventional molds, a randomness of molds with a similar technique. For large numbers the merit in cycle time, in combination with the advantages on internal logistic operations, is an ability to produce (even) more efficiently. And that's something which comes first with us.